From small cut-outs to cathedral magnificence: Matisse at the Tate Modern, London. New Order II: British Art Today great exhibition at the Saatchi Gallery, London. Great Lichtenstein reassessment exhibition at Tate Modern in London. 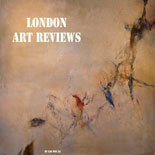 London Art Fair 2013 celebrates its 25th edition. “Patrick Keiller: The Robinson Institute” explores Tate Britain using psychogeography.